Fitted with the 22mm f/2 pancake lens, the M6 is very small indeed. While Canon has always been a dominant player in the DSLR market, its initial forays into mirrorless were undistinguished. But with last year’s SLR-style EOS M5 it showed much greater intent, and now it’s followed up with a new model: the EOS M6. 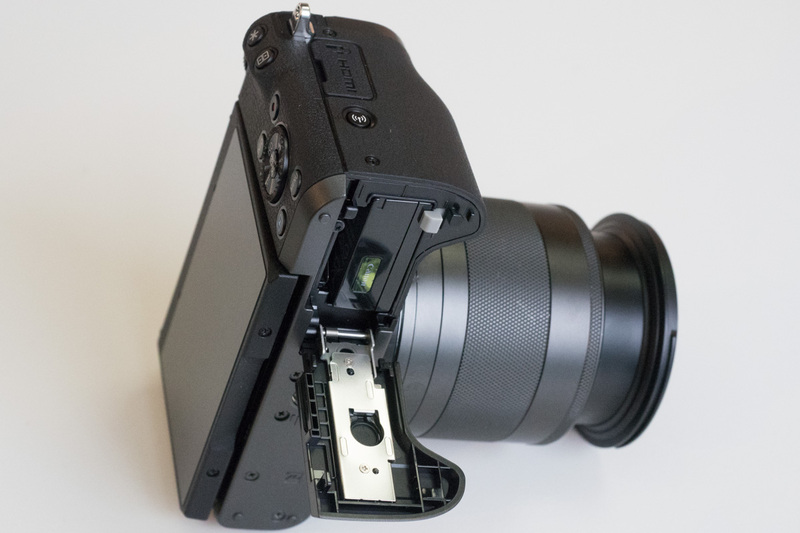 Replacing the 2-year-old EOS M3, in effect it can be seen an EOS M5 with the electronic viewfinder removed, but with the option to slot an accessory unit onto the hot shoe. Due to go on sale at the start of April, the EOS M6 will come in either silver or black versions – the latter actually sporting the same attractive gun-metal finish as the EOS M5. It’ll cost £729.99 body only, £839.99 with the compact retracting EF-M 15-45mm f/3.5-6.3 IS STM lens, or £1079.99 with the EF-M 18-150mm f/3.5-6.3 IS STM. Like its bigger brother, the M6 gains Canon’s Dual Pixel CMOS AF, which allows phase detection across almost the whole frame. Coupled with the Digic 7 processor this gives vastly improved autofocus speed – indeed if anything the M6 feels perhaps a little snappier than the EOS M5. Burst shooting is radically improved over the EOS M3, at up to 9 frames per second (vs 4.2fps) or 7 fps with autofocus between frames, and with a buffer of 17 raw or 26 JPEG frames. Meanwhile the 24.2-million-pixel sensor provides a sensitivity range covering ISO 100-25,600 while shutter speeds range from 30-1/4000sec. Canon uses an electronic first curtain to minimise any risk of shutter-induced blur in your shots, but unusually for a modern CSC there’s no silent fully-electronic shutter option. A small built-in flash pops up out of the top-plate for those occasions when you need a blip of extra light, while a hot-shoe beside it accepts more powerful add-on Speedlites. However you can’t use an external flash and electronic viewfinder at the same time, as both attach to the same location. The rear 3-in, 1.04-million-dot screen has a 3:2 aspect ratio to match the sensor and is touch sensitive. It can tilt downwards by 45° for overhead shooting, upwards for use as a waist-level viewfinder, and even face fully forwards for shooting selfies. As usual for Canon it looks bright and detailed, and the touch response is excellent. Onscreen display options include gridlines, electronic levels and a live histogram – either luminance or RGB. 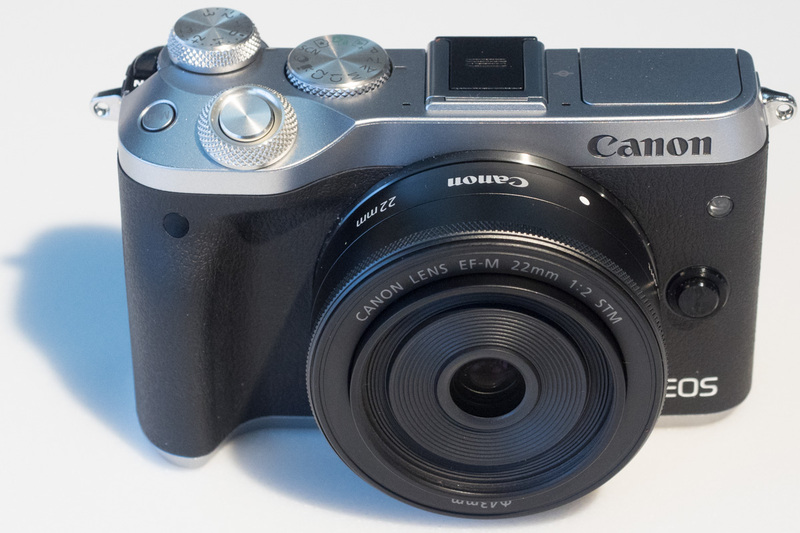 Canon has shown that it knows how to make small cameras that are pleasant to use, and despite its petite dimensions and light weight – 112 x 68 x 44.5 mm and 390g – the M6 feels good in your hand. The small grip provides a surprisingly secure hold, and Canon has left a reasonable amount of space for your thumb, with a small ‘hook’ on the edge of the camera to stop it from slipping out of your grasp. Despite its compact size, Canon has covered the EOS M6’s body with a profusion of buttons and dials, almost all of which are positioned for operation by your right hand. A dedicated exposure compensation dial is stacked on top of a new thumbdial, which together with the main dial around the shutter button allows easy control of the main exposure settings. 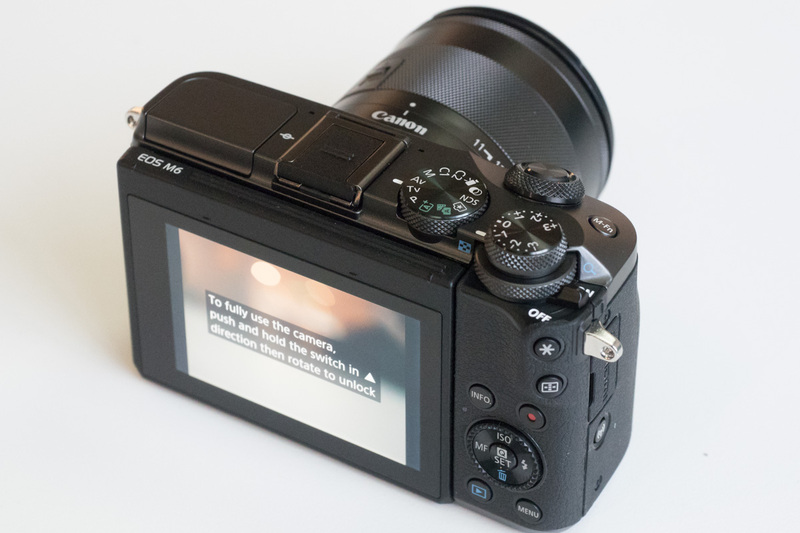 Buttons on the back give direct access to other key settings, while the tilting touchscreen is the natural way of setting the autofocus point. 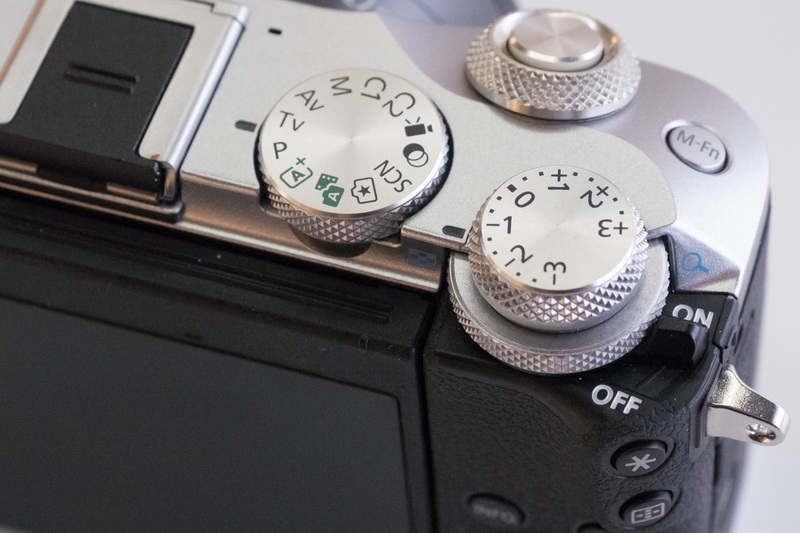 There’s a user-configurable M-Fn button on the top plate, while Canon’s onscreen touch-sensitive Q menu gives another means to access secondary shooting settings. Certain other companies could learn a lot from how Canon manages to fit so much into so little space (that means you, Sony). As we’d expect, Canon has built Wi-Fi into the EOS M6, with Dynamic NFC for pairing with compatible devices. Canon’s Wi-Fi implementation is broad ranging; aside from being able to connect to a smartphone or tablet for image sharing and remote control, it can also send images directly to compatible printers, or be used to show off your images on a smart TV without having to plug in an HDMI cable. Canon has also included Bluetooth to form a permanent connection to your smartphone, a feature we previously saw on the EOS M5, and on which it worked exceptionally well. When used with the free Canon Camera Connect app for Android or iOS, this allows your phone to be used as a simple remote control at any time, without having to mess around with setting up a Wi-Fi connection between the two devices. The Bluetooth connection can also instruct the camera to fire up its Wi-Fi for when you want to copy images across to your phone, or use full remote control with live view. Strangely though, the EOS M6 isn’t compatible with the BR-E1 Bluetooth remote control that was announced alongside the EOS 77D and EOS 800D DSLRs. However all is not lost, as it still works with both the RC-6 infrared remote release, and the Rs-60E3 wired remote release. While many cameras these days are offering 4K video, Canon has decided to play it safe on the EOS M6 and only include conventional Full HD (1920 x 1080 pixel) resolution at up to 60 frames per second. 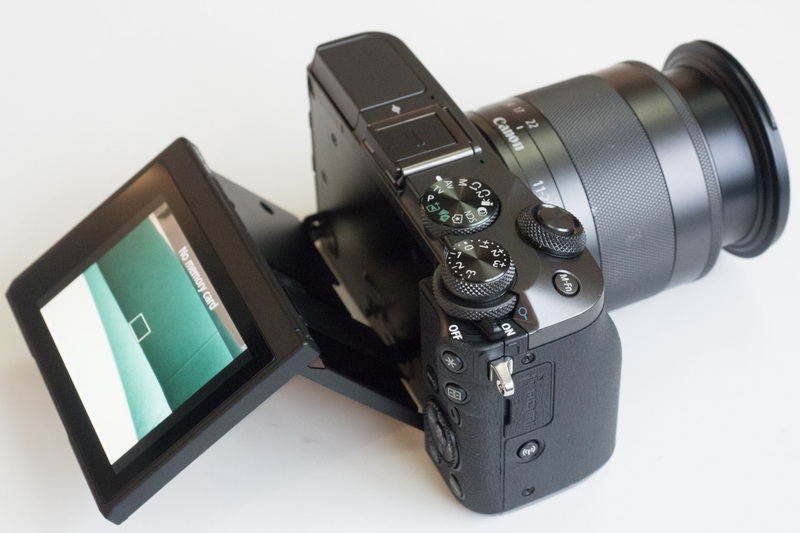 However one significant addition is the 5-axis in-body electronic image stabilisation that we previously saw in the EOS M5, and which worked quite well. Crucially this works with almost any lens, although it gives best results when it works in co-operation with an optically-stabilised lens. Canon has designed a new viewfinder to match the EOS M6, the EVF-DC2. Like the existing EVF-DC1 this slides onto the hot-shoe, with a series of electronic contacts to communicate with the camera. It offers 2.36-million-dots resolution, and while it technically uses a smaller panel 0.39-type, compared side-by-side it offers an almost identical view to the EVF-DC1, at around 0.63x magnification. 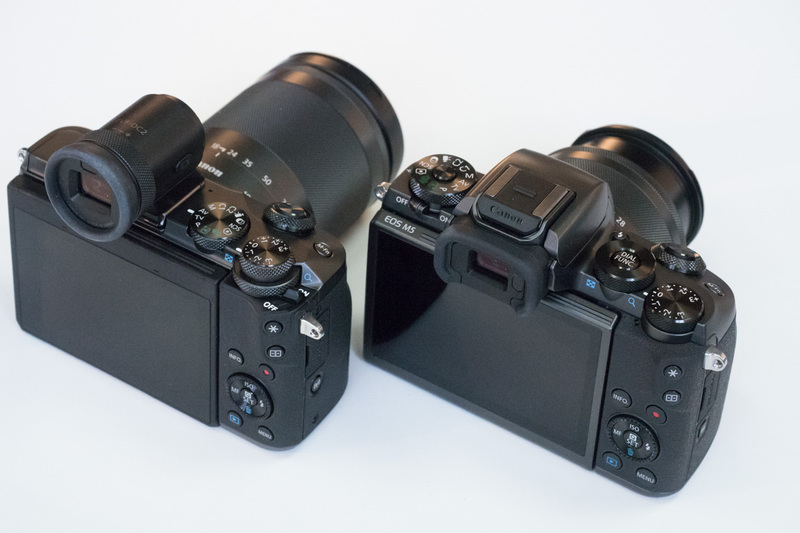 The EVF-DC2 entirely cross-compatible with the older viewfinder, meaning it can be used with cameras such as the PowerShot G1 X Mark II, PowerShot G3 X and EOS M3, while the EOS M6 can use the EVF-DC1. However the EVF DC2 doesn’t tilt, which means it’s more compact. It’ll come in black or silver to match the EOS M6, with a recommended price of £219.99. 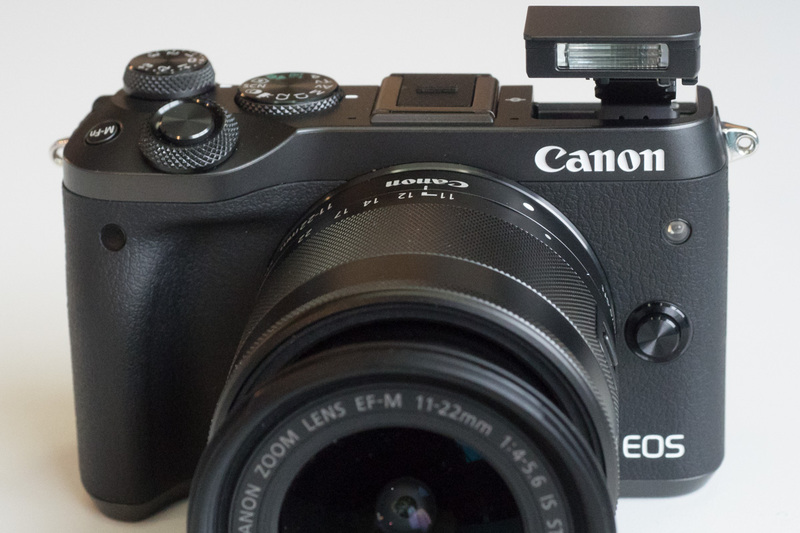 Canon seems to have put its earlier underwhelming attempts at mirrorless well and truly into the past, and from our first hands-on time with the EOS M6, it joins the EOS M5 in providing a much better user experience. It takes the best bits of the EOS M3 – its neat design and user interface – and improves upon them further, while fixing its predecessor’s comparatively sluggish operation. 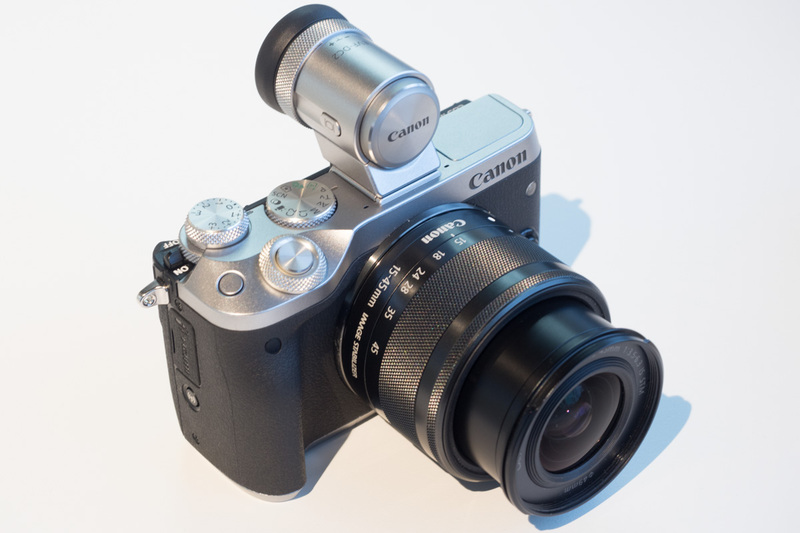 Coupled with Canon’s traditionally fine image quality, this should make for a rather likeable little camera. In a way, though, it’s a surprise seeing Canon persist with the design strategy of making a enthusiast-level CSC with a removable EVF. Other companies have largely stepped back from this approach and settled on using built-in viewfinders, which serious photographers seem to prefer. 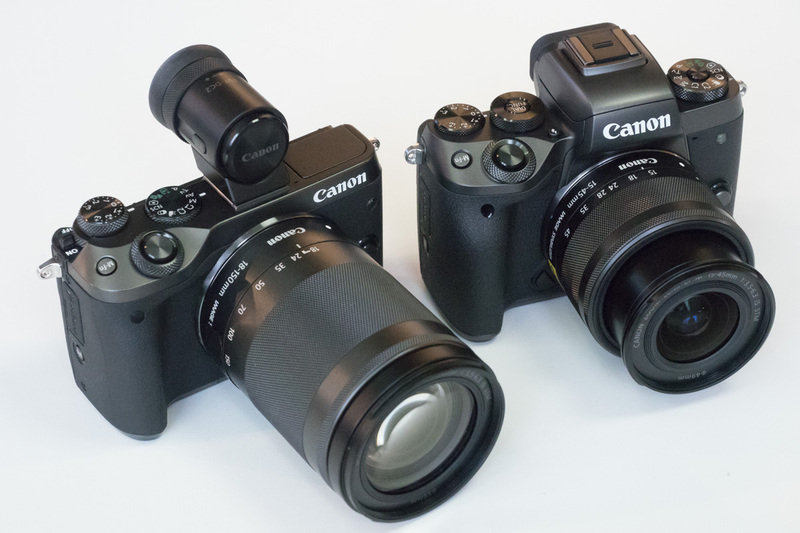 Presumably Canon sees it as the best way of offering its Dual Pixel CMOS sensor and its associated speed benefits at a lower price compared to the EOS M5, and has been satisfied with the EOS M3’s sales. It’ll be very interesting to see whether photographers take to the new model or not.